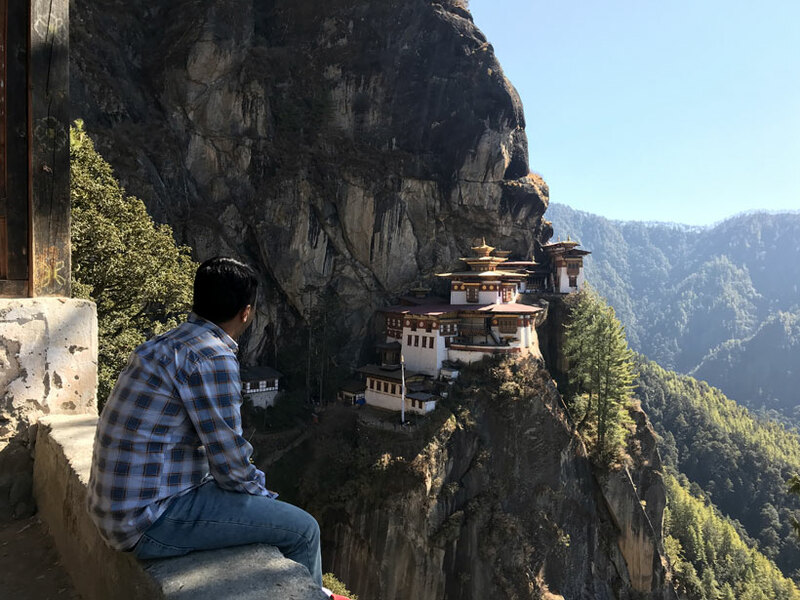 As per Bhutan government’s policy, citizens of all countries, except from India, Bangladesh and Maldives, have to book their tour through a registered travel agent and pay US$250 per person, per day to be able to secure a permit or visa. This is mandatory! Having said that, all expenses in this itinerary are for individual travel and does not apply to the mandated travel agency’s or tour operator’s costs. However, you can get an idea of costs, along with tips and details of places you’d like to visit. 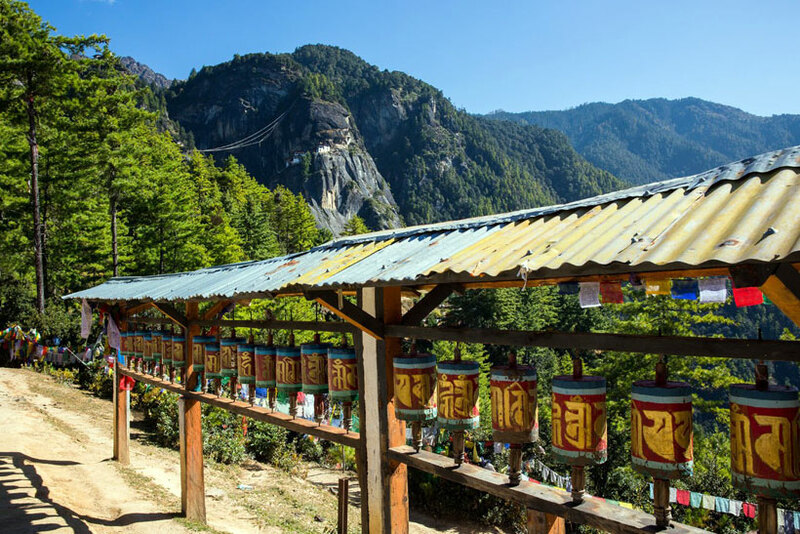 Every single postcard or a picture of Bhutan will show Tiger’s Nest Monastery, perched up high on the hill. 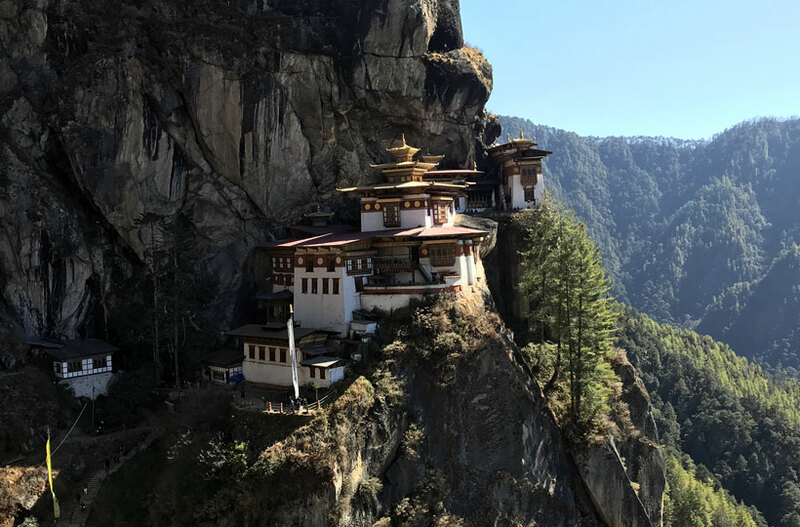 Also known as Paro Taktsang Lhakhang, this is considered to be the most sacred site in Bhutan. The monastery is located around 12kms (about 7.45 miles) from Paro center. I was up early and after breakfast at the hotel, I took a cab to reach the base point (Ramthangkha). Most taxi drivers will charge BTN 300-400 one-way in a shared taxi, but make sure to haggle and bring down to BTN 200 at the least. They will charge BTN 50 per person to drop you on the main road from where the base point is 4kms. 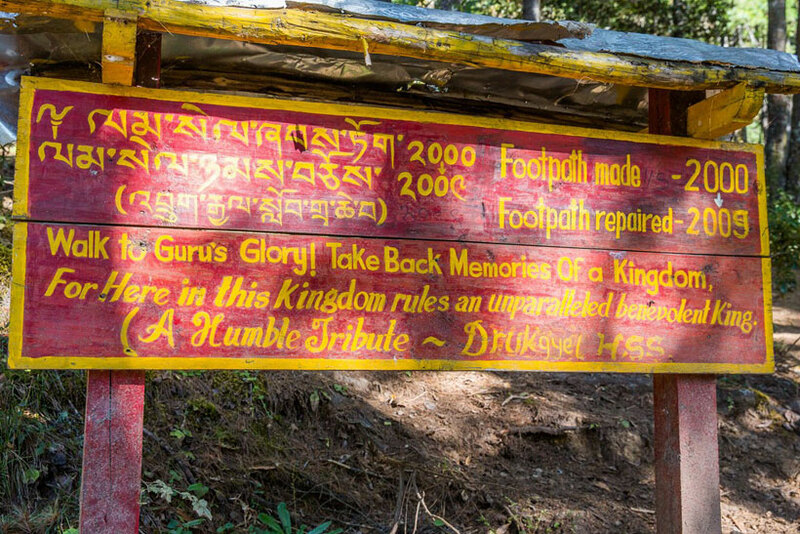 From the base point, Tiger’s Nest Monastery is 4.82kms (about 3 miles) one-way hike. I started my ascent at 8:30am, targeting to reach the top by wanted to reach to the top by 11am to avoid afternoon sun. Initial part of the trail passes through a beautiful pine forest with gradual comfortable slope. There are no real markings or directions along the whole trail, but there will always be many people hiking up or down making it easy to not get lost! 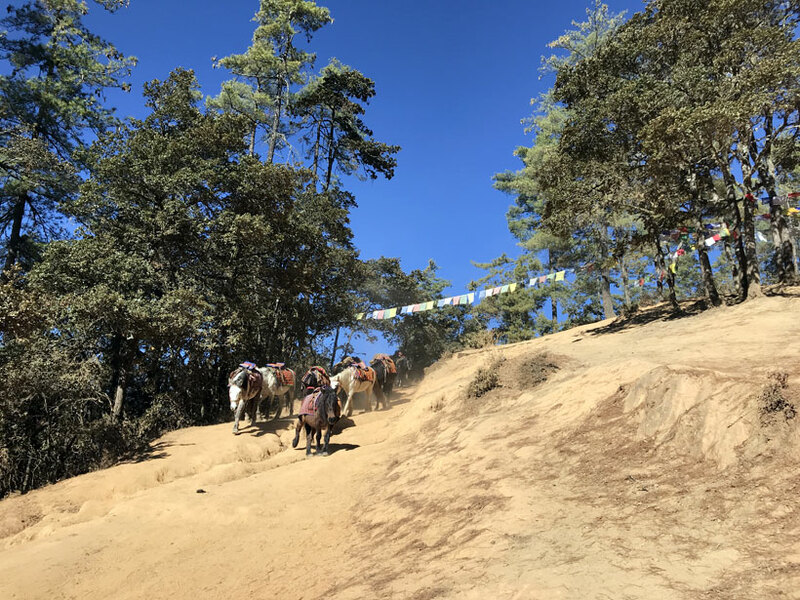 The first half of the hike can be covered on horses, and many people choose to do that. It costs BTN 500 one-way per horse. I kept walking through the forest warming up my self for around 5 minutes before I heard the sound of prayer wheels and flowing stream. This is when the forest transitions in to a mountain hike with slope getting slightly steeper and trail curling the mountain. 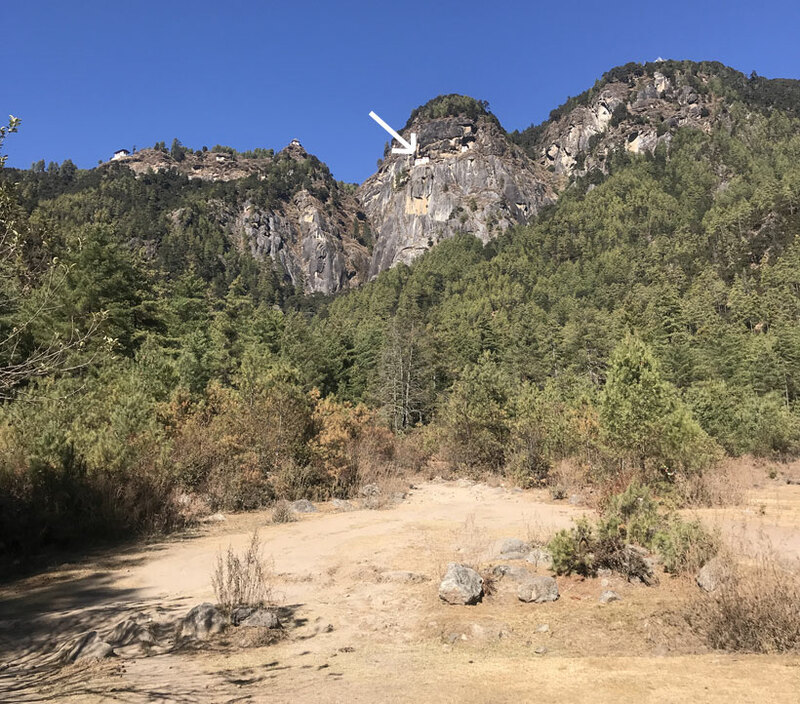 Here on, it is a semi-steep, 45 minute hike till you reach the mid point from where you get first glimpse of Tiger’s Nest Monastery. The views gets spectacular with each step. There are benches on the way for you to take rest and also water taps for drinking water. Take a short break at the mid-point and go to the cafeteria for some refreshments if you’re tired. A lot of people get the glimpse of the monastery from the mid-point and decide to walk back down. But the trail gets less steep from here and it’s an easy walk on flat trek. From here, it is another 45 minutes hike to the monastery and the trail is almost flat for a good second part of the hike. You reach the view-point from where the picture-perfect shot of the monastery is seen. This part is where the hike ends and gives way to a set of stairs. These stairs go down to a waterfall and then again ascend up to reach the Tiger’s Nest Monastery. This also turns out to be the euphoria moment of your hike as you get a view of the Tiger’s Nest Monastery first time with that single turn to the stairs. Photography is strictly prohibited inside the monastery. Camera and phones must be kept at the entrance in lockers. There are multiple temples inside the monastery where you can sit in peace and meditate. At the entrance is the ‘wish stone’ where people line up to put their thumb exactly in a hole (with closed eyes) for their wish to be granted. There is a lamp chapel where you can light a lamp by donating BTN 30. As you walk to the end, you see a panoramic view of the valley and the starting point of the hike making you proud of your accomplishment! Entry Fee: BTN 500 (for Indian/Bangladeshi/Maldivian citizens only) to be bought at the base point, BEFORE starting the hike. Moderate – Difficult: It took me approximately 1.5 hours to hike up to the monastery, about 2 hours around & in the monastery and 1 hour to come down. After reaching the back to the base point, I relaxed for a while and then walked 4kms to the main road. It’s an easy, downhill walk to the ‘highway’ across the river, leading to Paro. You can wait here for taxis passing by and it will cost BTN 50 per person in a shared taxi to Paro center. It was about 3pm when I reached back to center, so after a full lunch at Mountain Cafe, I headed to the hotel for some siesta. Some leisure walk & window shopping in the evening along the main street followed by a quiet dinner at the hotel was the highlight of a cold, crisp evening! Note: All values in USD, unless otherwise mentioned, are approximate and based on the exchange rate of USD 1 = BTN 71 at the time of publishing. Each cost is for one adult. Taxi (Shared) $2.82 BTN 200 one-way from Paro center to monastery base point. Taxi (Shared) $0.70 BTN 50 one-way from main road to Paro center. Lunch $5.11 BTN 363 at Mountain Cafe. Dinner $2.32 BTN 165 at Hotel Phunsum. Hike to the Tiger’s Nest Monastery & rest day in Paro. Day trip to Chele La Pass. Tips, info & details of planning. Arriving in Thimphu & sights of Thimphu. 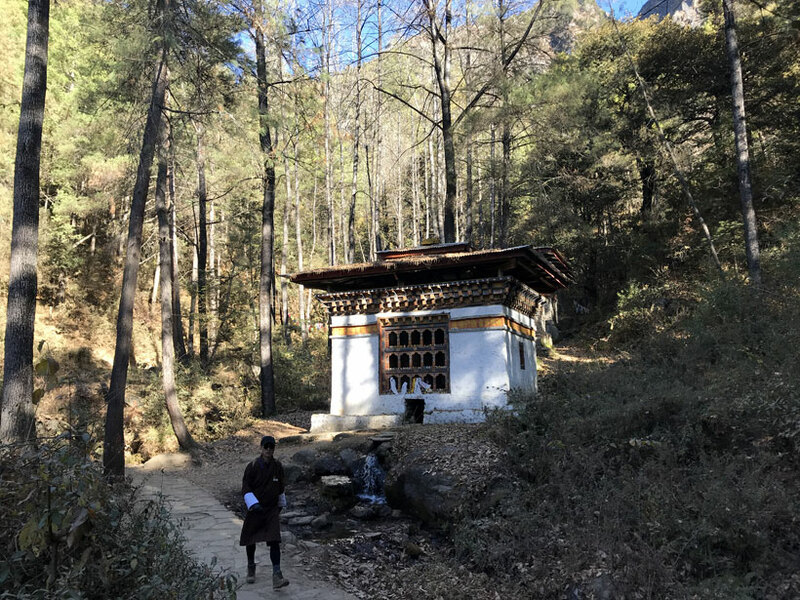 Getting permits in Thimphu & visiting Lobesa. Travel from Punakha to Paro, via Thimphu. Hike to Tiger's Nest & rest day in Paro. Taking flight out of Bhutan.